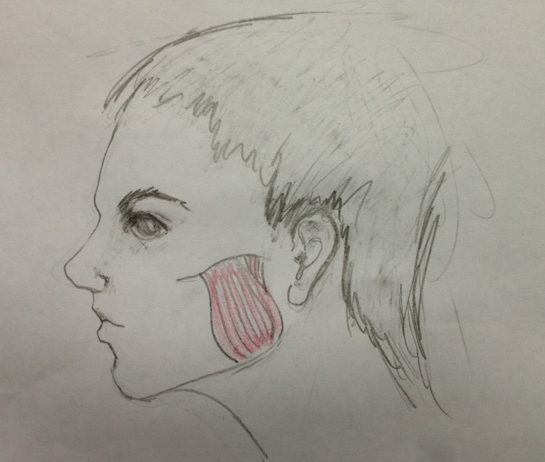 Trigger points in the masseter muscles of the jaw can cause no end of mischief. They can be a cause of pain in both upper and lower teeth, as well as a source of tooth hypersensitivity to hot and cold temperatures. They can also cause pain under the eyes, over the eyebrows, often mistaken for sinusitis. They can cause deep inner ear pain and a sense of a low ‘roaring’ sound. The resulting tightness in the jaw’s ability to move properly encourages tightness in the vocal mechanism. Various singers with whom I have treated this muscle have reported to me a better ability to reaching their notes afterwards. Trigger points can be created in this muscle by chewing gum and biting nails. This muscle is easy to self treat however, good news for all! You just need to put your thumb inside your mouth and squeeze the muscle between your thumb and forefingers. It feels thick and rubbery. Find any sore spot along the muscle, which will be eye-wateringly painful when the muscle contains trigger points. Squeeze as much as you can bear, each day until it no longer hurts. You will feel the results immediately. Alternately you can mention it when booking in for your deep tissue massage treatment and have it treated for you.